BURGAS, Bulgaria, July 19 (Reuters) - A suicide bomber carried out the attack that killed eight people in a bus transporting Israeli tourists in Bulgaria, the country's interior minister said on Thursday, and Israel accused Iranian-backed Hezbollah militants of responsibility. Video surveillance in front of the airport and the investigation showed the bomber could not be distinguished among arriving Israeli tourists, Interior Minister Tsvetan Tsvetanov said at the airport of Burgas, on Bulgaria's Black Sea coast. "We have established there was a person who was a suicide bomber in this attack (on Wednesday). This person had a fake driving licence from the United States, from the state of Michigan," Tsvetanov told reporters. "He looked like anyone else - a normal person with Bermuda shorts and a backpack," he said. Special forces had managed to obtain DNA samples from the fingers of the bomber and were now checking databases in an attempt to identify him, Tsvetanov said. Bulgarian security services had received no indications of a pending attack. Tsvetanov said eight people were killed in the attack including the Bulgarian driver of the bus and the bomber. The Israeli foreign ministry said it could confirm that five Israelis were killed. The tourists had arrived in Bulgaria on a charter flight from Israel and were on the bus in the airport car park when the blast tore through the double-decker. Body parts were strewn across the ground, mangled metal hung from the bus's ripped roof and black smoke billowed over the airport. On Thursday, the airport in Burgas - a city of some 200,000 people at the centre of a string of seaside resorts - remained closed and police prevented people from approaching. Beyond the cordons, some 100 holidaymakers waited patiently for their planes but had been told they would be there until midnight. Officials were setting up portable toilets and tents for stranded travellers and Bulgaria's parliament opened with a one minute silence in memory of the bombing victims. Israeli Defence Minister Ehud Barak said the Tehran-backed Lebanese Shi'ite Muslim group Hezbollah carried out the bombing. "The immediate executors are Hezbollah people, who of course have constant Iranian sponsorship," Barak told Israel Radio. The blast occurred on the 18th anniversary of a bomb attack at the headquarters of Argentina's main Jewish organisation that killed 85 people and the Argentine government blamed on Iran, which denied responsibility. Israeli Prime Minister Benjamin Netanyahu said Iran, the Jewish state's arch-enemy, was behind the attack and that "Israel will react powerfully against Iranian terror." There was no immediate Iranian reaction to the Israeli accusation. Medical officials said two badly injured Israeli tourists were taken to hospitals in Bulgaria's capital Sofia. One woman was in intensive care with head and chest injuries and a man was in a critical state with burns covering 55 percent of his body. About 30 lightly injured Israeli tourists were to be flown back to Israel later on Thursday. Israeli officials had previously said that Bulgaria, a popular holiday destination for Israeli tourists, was vulnerable to attack by Islamist militants who could infiltrate via Turkey. Although Tehran has denied involvement, some analysts believe it is trying to avenge the assassinations of several scientists from its nuclear programme that the Iranians have blamed on Israel and its Western allies. Israel and Western powers fear Iran is working towards a nuclear bomb but it says its uranium enrichment work is strictly for peaceful ends. Both Israel and the United States have not ruled out military action against Iranian nuclear facilities. 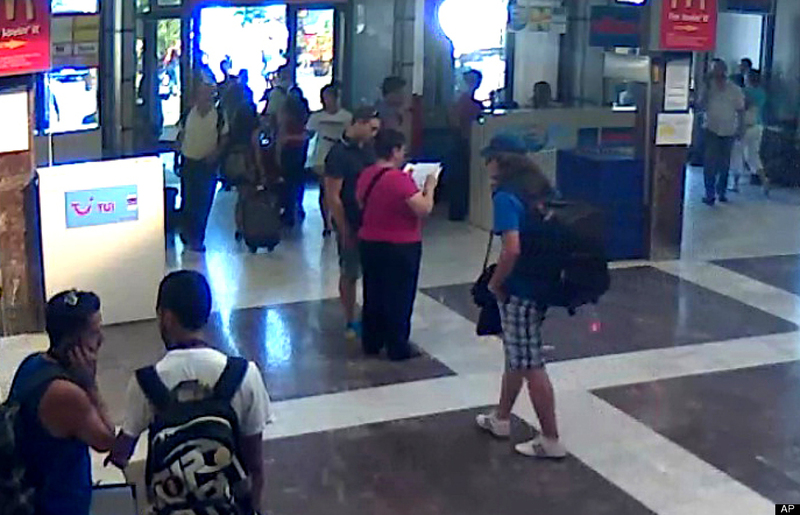 Video appears to show suspect in suicide blast at Borgas airport.